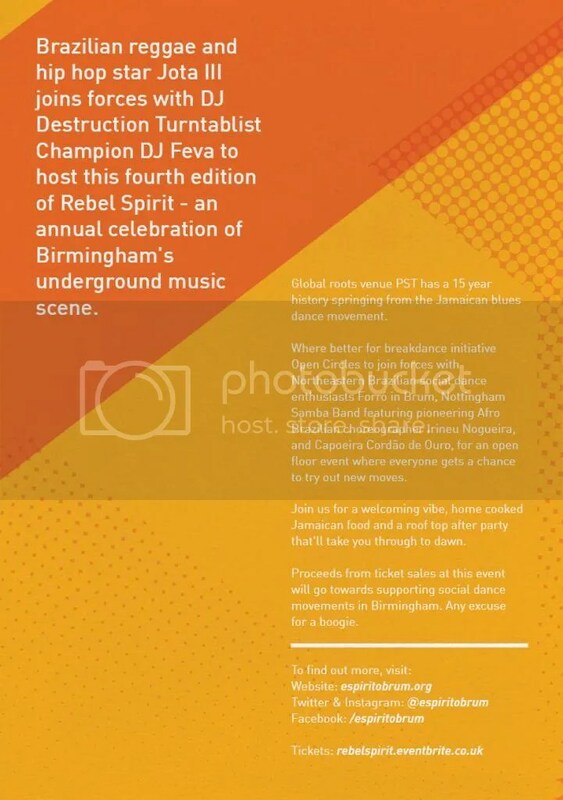 Rebel Spirit – in association with IDFB – 24TH MAY @ PST! As part of Espirito Brum 2014, and in association with International Dance Festival Birmingham’s Paint the Town Red Series, we’re proud to announce the return of Rebel Spirit. Brazilian reggae and hip hop star Jota III joins forces with DJ Destruction Turntablist Champion DJ Feva to host this fourth edition of our ongoing celebration of Birmingham’s underground music scene. Where better for breakdance initiative Open Circles to join forces with Northeastern Brazilian social dance enthusiasts Forró in Brum, Nottingham Samba Band featuring pioneering Afro Brazilian choreographer Irineu Nogueira, and Capoeira Cordão de Ouro, for an open floor event where everyone gets a chance to try out new moves. Join us for a welcoming vibe, home cooked Jamaican food and a roof top after party that’ll take you through to dawn. Proceeds from ticket sales at this event will go towards supporting social dance movements in Birmingham. Any excuse for a boogie ;). Rebel Spirit – in association with IDFB.